Lets not sugar coat it – student loan debt is KILLING new graduates. Too many intelligent young people are being ‘conned’ into taking out massive loans that will pay for an education that will probably not even lead to a satisfying, well paying job. Don’t get me wrong – we have both achieved high levels of conventional education (Post-graduate level) but we disagree strongly with 18 year olds taking on tens of thousands of dollars of debt at 7% interest rates to pursue what society tells you that you HAVE TO DO. 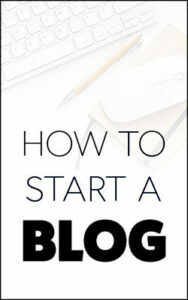 Blogging is by far the biggest source of extra income for us. If you are interested in starting a blog of your own, we wrote a step-by-step tutorial that shows you how to easily make a blog of your own in just minutes. You can find the tutorial here. It is very interesting that a person will pay a college a small fortune, with the high risk of no return on investment after 4 years of working hard. However, that same person will not shell out $197 for a course in affiliate marketing that is much more likely to return them a fortune! Sobering Statistics – Americans are more burdened by student loan debt than any other time in history. Americans owe over $1.48 trillion in student loan debt. Wow! The average graduate is looking at $40k in student loans that immediately start to gather momentum as the interest compounds. The danger with student loans does not lie in the total amount, but rather that the balance will go up even if you meet the minimum payments. It is compound interest working against you and this is why people have a very difficult time escaping the student loan cycle prison. This is especially true if you have student loans for bad credit – the interest rates are SO high. Here are some of the ways that we used to pay off our student loan debt – you CAN do this! It takes a bit of sacrifice, hard work and working smarter! Over the last few years we have had to work really hard to find ways to earn extra income to help pay of our student loans. Luckily, Maleah was the only one of us that had students loans from her undergraduate and graduate degrees. We had to work very hard to pay off undergraduate student loans (‘only’ $22,000). The key for us was to earn extra money on the side, doing everything from trading stocks to starting money making websites and blogs. Little did we know that learning to make extra income would become a huge passion and lead to a life free of the 9-5 work world! We have come a long way since those days! In September 2017 we made $10,533 and in December 2017 we made $10,880 of extra income by blogging and affiliate marketing. We have done so much to get to this level of side income, you can read about the different ways to make some extra money on our make extra money page. So if your goal right now is to pay off your student loans as fast as possible, then consider starting a blog or side hustle and put ALL of the extra income towards paying down your student loan principle. 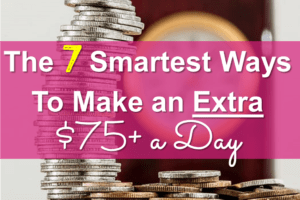 Luckily, we have written extensively on the best ways to make some extra money, so check out the related articles below! So many people are dealing with student loan debt these days. Something that you might have heard about, but not looked into, is refinancing your loans to reduce your monthly payments. It is VERY worthwhile to take a few minutes out of your day and refinance your student loans. Refinancing your student loans through LendEdu may help you to save thousands of dollars, and dramatically reduce how long you are paying your loans off as well! The average student loan refinance can save you $13,438 and LendEdu is completely free to use and does not adversely effect your credit score. Compare student loan interest rates for free in less than three minutes! Lenders like LendEdu will compare your existing loans with others and try to get you a drastically better rate! They will make money from the interest and you get to save a ton of money! Truly a win-win for everyone involved. Refinancing your loans is very easy to do and I promise, you will wish you had done it years ago! So don’t put it off any longer – refinance your student loans today! The final tip we have is for those of you that have a choice of employer. Many employers will pay off some or even ALL of your student loans! This is a potential game changer for some people! Here is a very brief list of some of the best employers to work for if you want some help to pay of your student loans. If you could work for one of these employers, it might be worth your time to research exactly what they can do to help you get rid of your loans once and for all. US Military: There are many US Military programs designed specifically for student loan repayment. They vary in degrees and skill level. US Government: U.S. Government employees may qualify for student loan repayment assistance through The Federal Student Loan Repayment Program. Fidelity Investment: Fidelity reimburses $2,000 per year for its employees with student loans. The program caps off at $10,000. First Republic Bank: This bank offers $100 – $200 per month towards reimbursement of its employees’ student loans. Employees must work at least 20 hours a week to qualify. Nvidia: This company offers up to $6,000 per year to its employees to help pay down their student debt. Employees must work at least 20 hours a week to qualify. Penguin Random House: Penguin Random House reimburses up to $1,200 a year for student loan debt, and it caps at $9,000. Employees are required to be full time and have worked at the company for at least one year. PricewaterhouseCoopers: This company offers its employees up to $1,200 per year towards student loan debt. Aetna: The retailer helps full-time sales associates repay their student loans with $1,200 per year and will pay up to $3,600. Chegg: Chegg offers $1,000 annually towards employees’ student loan debt. CommonBond: This company, offers its 90 employees $1,200 a year towards their student loan debt. LendEDU: This company offers employees $200 a month toward student loan debt. There is currently no cap for that benefit! They are also one of the leading companies to refinance your loans with. Powertex: This company offers its 75 employees $100 a month towards student loan debt for up to six years. Yes , student loan forgiveness is a real thing! Almost all the states offer programs that help you repay your student loans. This is a very complicated arena, and there is really no way to know what the best way to try and get student loan forgiveness is for you – the best course of action is particular to your own circumstances. Many ways of getting student loan forgiveness are possible, from working at a non-profit to volunteering your time. If you want to try to apply for loan forgiveness, I highly recommend that you check out this extensive article for the best way to do it. We hope you found this article full of tips for paying off student loans useful. Student loan debt is a huge issue for many young people today. It can and often does kill dreams. 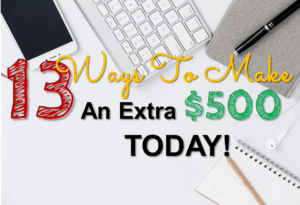 13 Ways To Make An Extra $500 Today! If the tips for paying off student loans discussed in this article can help just one person, we would be very happy indeed. Good luck to anyone burdened with this type of debt and please feel free to vent about it in the comments below or offer other helpful suggestions! Do you have a story about paying off student loans? Comment below!